An optical fiber (or optical fibre) is a glass or plastic fiber designed to guide light along its length by confining as much light as possible in a propagating form. In fibers with large core diameter, the confinement is based on total internal reflection. In smaller diameter core fibers, (widely used for most communication links longer than 200 meters (m)) the confinement relies on establishing a waveguide. Fiber optics is the overlap of applied science and engineering concerned with such optical fibers. Optical fibers are widely used in fiber-optic communication, which permits transmission over longer distances and at higher data rates than other forms of wired and wireless communications. They are also used to form sensors, and in a variety of other applications. The term optical fiber covers a range of different designs including graded-index optical fibers, step-index optical fibers, birefringent polarization-maintaining fibers, and more recently, photonic crystal fibers, with the design and the wavelength of the light propagating in the fiber dictating whether or not it will be multi-mode optical fiber or single-mode optical fiber. Because of the mechanical properties of the more common glass optical fibers, special methods of splicing fibers and of connecting them to other equipment are needed. Manufacture of optical fibers is based on partially melting a chemically doped preform and pulling the flowing material on a draw tower. Fibers are built into different kinds of cables depending on how they will be used. The light-guiding principle behind optical fibers was first demonstrated in by Daniel Collodon and Jaques Babinet in the 1840s, with Irish inventor John Tyndall offering public displays using water-fountains ten years later. Practical applications, such as close internal illumination during dentistry, appeared early in the twentieth century. Image transmission through tubes was demonstrated independently by the radio experimenter Clarence Hansell and the television pioneer John Logie Baird in the 1920s. The principle was first used for internal medical examinations by Heinrich Lamm in the following decade. Modern optical fibers, where the glass fiber is coated with a transparent cladding to offer a more suitable refractive index, appeared in the 1950s. 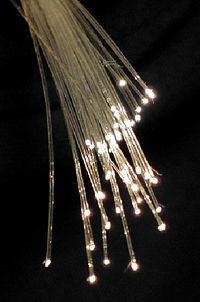 Optical fibers became practical for use in communications in the late 1970s, once the attenuation was reduced sufficiently; since then, several technical advances have been made to improve the attenuation and dispersion properties of optical fibers (that is, allowing signals to travel farther and carry more information), and lower the cost of fiber communications systems. In 1952 physicist Narinder Singh Kapany conducted experiments that led to the invention of optical fiber, based on Tyndall's earlier studies. Later development, in the early-to-mid twentieth century, focused on the development of fiber bundles for image transmission, with the primary application being the medical gastroscope. The first fiber optic semi-flexible gastroscope was patented by Basil Hirschowitz, C. Wilbur Peters, and Lawrence E. Curtiss, researchers at the University of Michigan, in 1956. In the process of developing the gastroscope, Curtiss produced the first glass-clad fibers; previous optical fibers had relied on air or impractical oils and waxes as the low-index cladding material. A variety of other image transmission applications soon followed. Optical fiber can be used as a medium for telecommunication and networking because it is flexible and can be bundled as cables. It is especially advantageous for long-distance communications, because light propagates through the fiber with little attenuation compared to electrical cables. This allows long distances to be spanned with few repeaters. Additionally, the light signals propagating in the fiber can be modulated at rates as high as 40 Gigabit (Gb)/s, and each fiber can carry many independent channels, each by a different wavelength of light. In total, a single fiber-optic cable can carry data at rates as high as 14444 Terabit (Tb)/s. Over short distances, such as networking within a building, fiber saves space in cable ducts because a single fiber can carry much more data than a single electrical cable. Fiber is also immune to electrical interference, which prevents cross-talk between signals in different cables and pickup of environmental noise. Because they are non-electrical, fiber cables can be used in environments where explosive fumes are present, without danger of ignition. Although fibers can be made out of transparent plastic, glass, or a combination of the two, the fibers used in long-distance telecommunications applications are always glass, because of the lower optical attenuation. Both multi-mode and single-mode fibers are used in communications, with multi-mode fiber used mostly for short distances (up to 500 m), and single-mode fiber used for longer distance "links." Because of the tighter tolerances required to couple light into and between single-mode fibers, single-mode transmitters, receivers, amplifiers, and other components are generally more expensive than multi-mode components. Optical fibers can be used as sensors to measure strain, temperature, pressure, and other parameters. The small size and the fact that no electrical power is needed at the remote location gives the fiber optic sensor advantages to conventional electrical sensor in certain applications. Optical fibers are used as hydrophones for seismic or SONAR applications. Hydrophone systems with more than 100 sensors per fiber cable have been developed. Hydrophone sensor systems are used by the oil industry as well as a few countries' naval forces. Both bottom mounted hydrophone arrays and towed streamer systems are in use. The German company Sennheiser developed a microphone working with a laser and optical fibers. Optical fiber sensors for temperature and pressure have been developed for downhole measurement in oil wells. The fiber optic sensor is well suited for this environment as it is functioning at temperatures too high for semiconductor sensors (Distributed Temperature Sensing). Another use of the optical fiber as a sensor is the optical gyroscope which is in use in the Boeing 767, some car models (for navigation purposes), and Hydrogen microsensors. An optical fiber doped with certain rare-earth elements such as erbium can be used as the gain medium of a laser or optical amplifier. Rare-earth doped optical fibers can be used to provide signal amplification by splicing a short section of doped fiber into a regular (undoped) optical fiber line. The doped fiber is optically pumped with a second laser wavelength that is coupled into the line in addition to the signal wave. Both wavelengths of light are transmitted through the doped fiber, which transfers energy from the second pump wavelength to the signal wave. The process that causes the amplification is stimulated emission. Optical fibers doped with a wavelength shifter are used to collect scintillation light in physics experiments. Optical fiber can be used to supply a low level of power (around one watt) to electronics situated in a difficult electrical environment. Examples of this are electronics in high-powered antenna elements and measurement devices used in high voltage transmission equipment. An optical fiber is a cylindrical dielectric waveguide that transmits light along its axis, by the process of total internal reflection. The fiber consists of a core surrounded by a cladding layer. To confine the optical signal in the core, the refractive index of the core must be greater than that of the cladding. The boundary between the core and cladding may either be abrupt, in step-index fiber, or gradual, in graded-index fiber. The propagation of light through a multi-mode optical fiber. Fiber with large (greater than 10 micrometer (μm) core diameter may be analyzed by geometric optics. Such fiber is called multimode fiber, from the electromagnetic analysis (see below). In a step-index multimode fiber, rays of light are guided along the fiber core by total internal reflection. Rays that meet the core-cladding boundary at a high angle (measured relative to a line normal to the boundary), greater than the critical angle for this boundary, are completely reflected. The critical angle (minimum angle for total internal reflection) is determined by the difference in index of refraction between the core and cladding materials. Rays that meet the boundary at a low angle are refracted from the core into the cladding, and do not convey light, and hence information, along the fiber. The critical angle determines the acceptance angle of the fiber, often reported as a numerical aperture. A high numerical aperture allows light to propagate down the fiber in rays both close to the axis and at various angles, allowing efficient coupling of light into the fiber. However, this high numerical aperture increases the amount of dispersion as rays at different angles have different path lengths and therefore take different times to traverse the fiber. A low numerical aperture may therefore be desirable. In graded-index fiber, the index of refraction in the core decreases continuously between the axis and the cladding. This causes light rays to bend smoothly as they approach the cladding, rather than reflecting abruptly from the core-cladding boundary. The resulting curved paths reduce multi-path dispersion because high angle rays pass more through the lower-index periphery of the core, rather than the high-index center. The index profile is chosen to minimize the difference in axial propagation speeds of the various rays in the fiber. This ideal index profile is very close to a parabolic relationship between the index and the distance from the axis. A typical single-mode optical fiber, showing diameters of the component layers. Fiber with a core diameter less than about ten times the wavelength of the propagating light cannot be modeled using geometric optics. Instead, it must be analyzed as an electromagnetic structure, by a solution of Maxwell's equations as reduced to the electromagnetic wave equation. The electromagnetic analysis may also be required to understand behaviors such as speckle that occur when coherent light propagates in multi-mode fiber. As an optical waveguide, the fiber supports one or more confined transverse modes by which light can propagate along the fiber. Fiber supporting only one mode is called single-mode or mono-mode fiber. The behavior of larger-core multimode fiber can also be modeled using the wave equation, which shows that such fiber supports more than one mode of propagation (hence the name). The results of such modeling of multi-mode fiber approximately agree with the predictions of geometric optics, if the fiber core is large enough to support more than a few modes. The waveguide analysis shows that the light energy in the fiber is not completely confined in the core. Instead, especially in single-mode fibers, a significant fraction of the energy in the bound mode travels in the cladding as an evanescent wave. 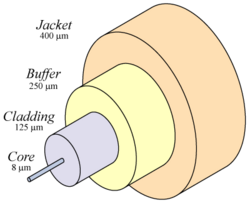 The most common type of single-mode fiber has a core diameter of 8 to 10 μm and is designed for use in the near infrared. The mode structure depends on the wavelength of the light used, so that this fiber actually supports a small number of additional modes at visible wavelengths. Multi-mode fiber, by comparison, is manufactured with core diameters as small as 50 microns and as large as hundreds of microns. Some special-purpose optical fiber is constructed with a non-cylindrical core and/or cladding layer, usually with an elliptical or rectangular cross-section. These include polarization-maintaining fiber and fiber designed to suppress whispering gallery mode propagation. Glass optical fibers are almost always made from silica, but some other materials, such as fluorozirconate, fluoroaluminate, and chalcogenide glasses, are used for longer-wavelength infrared applications. Like other glasses, these glasses have a refractive index of about 1.5. Typically the difference between core and cladding is less than one percent. Plastic optical fiber (POF) is commonly step-index multimode fiber, with core diameter of 1mm or larger. POF typically has much higher attenuation than glass fiber (that is, the amplitude of the signal in it decreases faster), 1 decibel (dB)/meter (m) or higher, and this high attenuation limits the range of POF-based systems. At high optical intensities, above 2 megawatts per square centimeter (cm), when a fiber is subjected to a shock or is otherwise suddenly damaged, a fiber fuse can occur. The reflection from the damage vaporizes the fiber immediately before the break, and this new defect remains reflective so that the damage propagates back toward the transmitter at 1–3 meters per second (mps). The open fiber control system, which ensures laser eye safety in the event of a broken fiber, can also effectively halt propagation of the fiber fuse. In situations, such as undersea cables, where high power levels might be used without the need for open fiber control, a "fiber fuse" protection device at the transmitter can break the circuit to prevent any damage. Standard optical fibers are made by first constructing a large-diameter preform, with a carefully controlled refractive index profile, and then pulling the preform to form the long, thin optical fiber. The preform is commonly made by three chemical vapor deposition methods: Inside vapor deposition, outside vapor deposition, and vapor axial deposition. With inside vapor deposition, a hollow glass tube approximately 40cm in length, known as a "preform," is placed horizontally and rotated slowly on a lathe, and gases such as silicon tetrachloride (SiCl4) or germanium tetrachloride (GeCl4) are injected with oxygen in the end of the tube. The gases are then heated by means of an external hydrogen burner, bringing the temperature of the gas up to 1900 Kelvin, where the tetrachlorides react with oxygen to produce silica or germania (germanium oxide) particles. When the reaction conditions are chosen to allow this reaction to occur in the gas phase throughout the tube volume, in contrast to earlier techniques where the reaction occurred only on the glass surface, this technique is called modified chemical vapor deposition. The oxide particles then agglomerate to form large particle chains, which are subsequently deposited on the walls of the tube as soot. The deposition is due to the large difference in temperature between the gas core and the wall causing the gas to push the particles outwards (this is known as thermophoresis). The torch is then traversed up and down the length of the tube to deposit the material evenly. After the torch has reached the end of the tube, it is then brought back to the beginning of the tube and the deposited particles are then melted to form a solid layer. This process is repeated until a sufficient amount of material has been deposited. For each layer the composition can be changed by varying the gas composition, resulting in precise control of the finished fiber's optical properties. In outside vapor deposition or vapor axial deposition, the glass is formed by flame hydrolysis, a reaction in which silicon tetrachloride and germanium tetrachloride are oxidized by reaction with water (H2O) in an oxyhydrogen flame. In outside vapor deposition the glass is deposited onto a solid rod, which is removed before further processing. In vapor axial deposition, a short seed rod is used, and a porous preform, whose length is not limited by the size of the source rod, is built up on its end. The porous preform is consolidated into a transparent, solid preform by heating to about 1800 Kelvin. The preform, however constructed, is then placed in a device known as a drawing tower, where the preform tip is heated and the optic fiber is pulled out as a string. By measuring the resultant fiber width, the tension on the fiber can be controlled to maintain the fiber thickness. This manufacturing process is accomplished by numerous optical fiber companies like Corning, OFS, Sterlite Optical Technologies, Furukawa, Sumitomo, Fujikura, and Prysmian. In addition, various fiber optic component manufacturers, assembly houses, and custom fiber optic providers exist. In practical fibers, the cladding is usually coated with a tough resin buffer layer, which may be further surrounded by a jacket layer, usually plastic. These layers add strength to the fiber but do not contribute to its optical wave guide properties. Rigid fiber assemblies sometimes put light-absorbing ("dark") glass between the fibers, to prevent light that leaks out of one fiber from entering another. This reduces cross-talk between the fibers, or reduces flare in fiber bundle imaging applications. For indoor applications, the jacketed fiber is generally enclosed, with a bundle of flexible fibrous polymer strength members like Aramid (for example Twaron or Kevlar), in a lightweight plastic cover to form a simple cable. Each end of the cable may be "terminated" with a specialized optical fiber connector to allow it to be easily connected and disconnected from transmitting and receiving equipment. For use in more strenuous environments, a much more robust cable construction is required. In loose-tube construction the fiber is laid helically into semi-rigid tubes, allowing the cable to stretch without stretching the fiber itself. This protects the fiber from tension during laying and due to temperature changes. Alternatively the fiber may be embedded in a heavy polymer jacket, commonly called "tight buffer" construction. These fiber units are commonly bundled with additional steel strength members, again with a helical twist to allow for stretching. Another critical concern in cabling is to protect the fiber from contamination by water, because its component hydrogen (hydronium) and hydroxyl ions can diffuse into the fiber, reducing the fiber's strength and increasing the optical attenuation. Water is kept out of the cable by use of solid barriers such as copper tubes, water-repellent jelly, or more recently water absorbing powder, surrounding the fiber. Finally, the cable may be armored to protect it from environmental hazards, such as construction work or gnawing animals. Undersea cables are more heavily armored in their near-shore portions to protect them from boat anchors, fishing gear, and even sharks, which may be attracted to the electrical power signals that are carried to power amplifiers or repeaters in the cable. Modern fiber cables can contain up to a thousand fibers in a single cable, so the performance of optical networks easily accommodates even today's demands for bandwidth on a point-to-point basis. However, unused point-to-point potential bandwidth does not translate to operating profits, and it is estimated that no more than 1 percent of the optical fiber buried in recent years is actually lit. Modern cables come in a wide variety of sheathings and armor, designed for applications such as direct burial in trenches, dual use as power lines, installation in conduit, lashing to aerial telephone poles, submarine installation, or insertion in paved streets. In recent years the cost of small fiber-count pole mounted cables has greatly decreased due to the high Japanese and South Korean demand for Fiber to the Home (FTTH) installations. Optical fibers are connected to terminal equipment by optical fiber connectors. These connectors are usually of a standard type such as FC, SC, ST, LC, or MTRJ. Optical fibers may be connected to each other by connectors or by "splicing," that is, joining two fibers together to form a continuous optical waveguide. The generally accepted splicing method is arc fusion splicing, which melts the fiber ends together with an electric arc. For quicker fastening jobs, a "mechanical splice" is used. Fusion splicing is done with a specialized instrument that typically operates as follows: The two cable ends are fastened inside a splice enclosure that will protect the splices, and the fiber ends are stripped of their protective polymer coating (as well as the more sturdy outer jacket, if present). The ends are "cleaved" (cut) with a precision cleaver to make them perpendicular, and are placed into special holders in the splicer. The splice is usually inspected via a magnified viewing screen to check the cleaves before and after the splice. The splicer uses small motors to align the end faces together, and emits a small spark between electrodes at the gap to burn off dust and moisture. Then the splicer generates a larger spark that raises the temperature above the melting point of the glass, fusing the ends together permanently. The location and energy of the spark is carefully controlled so that the molten core and cladding don't mix, and this minimizes optical loss. A splice loss estimate is measured by the splicer, by directing light through the cladding on one side and measuring the light leaking from the cladding on the other side. A splice loss under 0.1dB is typical. The complexity of this process is the major thing that makes fiber splicing more difficult than splicing copper wire. Mechanical fiber splices are designed to be quicker and easier to install, but there is still the need for stripping, careful cleaning and precision cleaving. The fiber ends are aligned and held together by a precision-made sleeve, often using a clear gel (index matching gel) that enhances the transmission of light across the joint. Such joints typically have higher optical loss, and are less robust than fusion splices, especially if the gel is used. All splicing techniques involve the use of an enclosure into which the splice is placed for protection afterward. Fibers are terminated in connectors so that the fiber end is held at the end face precisely and securely. 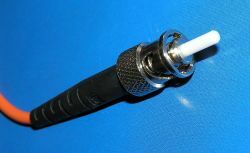 A fiber optic connector is basically a rigid cylindrical barrel surrounded by a sleeve that holds the barrel in its mating socket. It can be push and click, turn and latch, or threaded. A typical connector is installed by preparing the fiber end and inserting it into the rear of the connector body. Quick set glue is usually used so the fiber is held securely, and a strain relief is secured to the rear. Once the glue has set, the end is polished to a mirror finish. Various types of polish profile are used, depending on the type of fiber and the application. For singlemode fiber, the fiber ends are typically polished with a slight curvature, such that when the connectors are mated the fibers touch only at their cores. This is known as a "physical contact" (PC) polish. The curved surface may be polished at an angle, to make an angled physical contact (APC) connection. Such connections have higher loss than PC connections, but greatly reduced backreflection, because light that reflects from the angled surface leaks out of the fiber core; the resulting loss in signal strength is known as gap loss. Various methods to align two fiber ends to each other or one fiber to an optical device (VCSEL, LED, waveguide and so forth) have been reported. They all follow either an active fiber alignment approach or a passive fiber alignment approach. In 1965, Charles K. Kao and George A. Hockham of the British company Standard Telephones and Cables were the first to suggest that attenuation of contemporary fibers was caused by impurities, which could be removed, rather than fundamental physical effects such as scattering. They speculated that optical fiber could be a practical medium for communication, if the attenuation could be reduced below 20 dB per kilometer (km) (Hecht, 1999, p. 114).This attenuation level was first achieved in 1970, by researchers Robert D. Maurer, Donald Keck, Peter Schultz, and Frank Zimar working for American glass maker Corning Glass Works, now Corning Inc. They demonstrated a fiber with 17 dB optic attenuation per km by doping silica glass with titanium. A few years later they produced a fiber with only 4 db/km using germanium oxide as the core dopant. Such low attenuations ushered in optical fiber telecommunications and enabled the Internet. On 22 April, 1977, General Telephone and Electronics sent the first live telephone traffic through fiber optics, at 6 Mbit/s, in Long Beach, California. The erbium-doped fiber amplifier, which reduced the cost of long-distance fiber systems by eliminating the need for optical-electrical-optical repeaters, was invented by David Payne of the University of Southampton, and Emmanuel Desurvire at Bell Laboratories in 1986. The two pioneers were awarded the Benjamin Franklin Medal in Engineering in 1998. The first transatlantic telephone cable to use optical fiber was TAT-8, based on Desurvire optimized laser amplification technology. It went into operation in 1988. TAT-8 was developed as the first transatlantic undersea fiber optic link between the United States and Europe. TAT-8 is more than 3000 nautical miles in length and was the first oceanic fiber optic cable. It was designed to handle a mix of information. When inaugurated, it had an estimated lifetime in excess of 20 years. TAT-8 was the first of a new class of cables, even though it had already been used in long-distance land and short-distance undersea operations. Its installation was preceded by extensive deep-water experiments and trials conducted in the early 1980s to demonstrate the project's feasibility. In 1991, the emerging field of photonic crystals led to the development of photonic crystal fiber , which guides light by means of diffraction from a periodic structure, rather than total internal reflection. The first photonic crystal fibers became commercially available in 1996. Photonic crystal fibers can be designed to carry higher power than conventional fiber, and their wavelength dependent properties can be manipulated to improve their performance in certain applications. ↑ Regis J. Bates, Optical Switching and Networking Handbook (New York: McGraw Hill, 2001, ISBN 007137356X). ↑ Telepolis, Der Glasfaser. Retrieved October 26, 2017. ↑ Optics Letters, Track of a Fiber Fuse. Retrieved October 26, 2017. ↑ Koji Seo, Naoya Nishimura, Masato Shiino, Ren'ichi Yuguchi, and Hirokazu Sasaki, Evaluation of High-power Endurance in Optical Fiber Links. Retrieved October 26, 2017. ↑ John D. Cressler, Silicon Earth: Introduction to Microelectronics and Nanotechnology, Second Edition (CRC Press, 2015, ISBN 978-1498708258). FOA color code for connectors. Lennie Lightwave's Guide To Fiber Optics. "Fibers," article in RP Photonics' Encyclopedia of Laser Physics and Technology. "Fibre optic technologies," Mercury Communications Ltd, August 1992. "Photonics & the future of fibre," Mercury Communications Ltd, March 1993. This page was last modified on 21 December 2018, at 19:11.